(Malin+Goetz) is a New York-based skincare and perfume line that creates modern, unisex products for hair, body and skin. 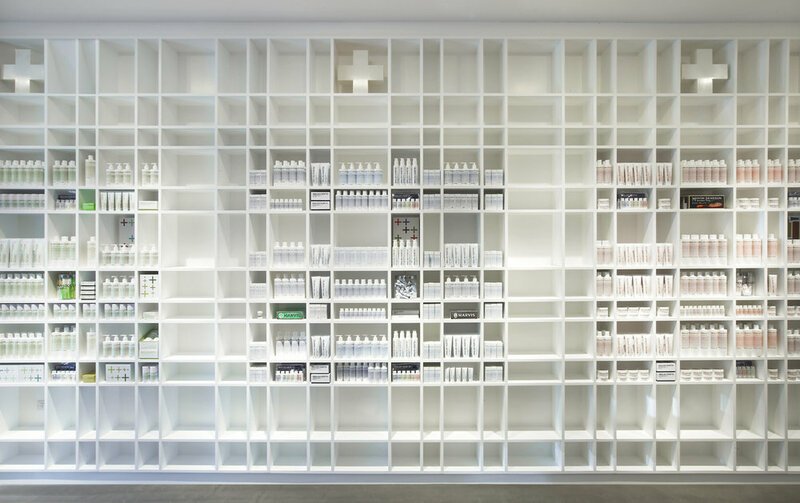 Their existing retail stores in New York reflect a modernization of traditional neighborhood apothecary concepts that create a distinctive, elegant and unique experience for the customers. For their first Los Angeles store in historic Larchmont Village in Hancock Park, we organized the space to highlight and showcase their product in various ways. We developed a custom shelving system that is precisely calibrated to the proportions of their product and allows for very deliberate display as well as the ability for flexibility. That system is continued on the opposite wall with a recessed niche within a series of panels that are milled with the "shelving" pattern. In addition to the shelving, an antique milliner's table anchors the space and provides additional merchandising opportunities. For the exterior, BA created a minimal and clean facade with a large glass opening within a white solid surface threshold and a small display niche. A custom shelving system is precisely calibrated to the proportions of the product.